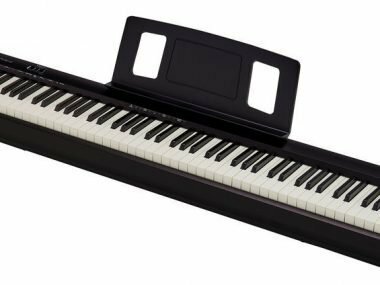 Roland FP-10 Review – Better Than The Yamaha P-45? The MIDI controller is becoming the most used instrument in the music industry and for good reason: they’re universal. If you go to any concert and the band uses keyboards, there’s an extremely high chance that you see one or two on stage. The technology has also gotten insanely good over since when they first hit the market. Not all MIDI controllers are keyboards. Some are drum pads and they don’t have actual keys, just pads. 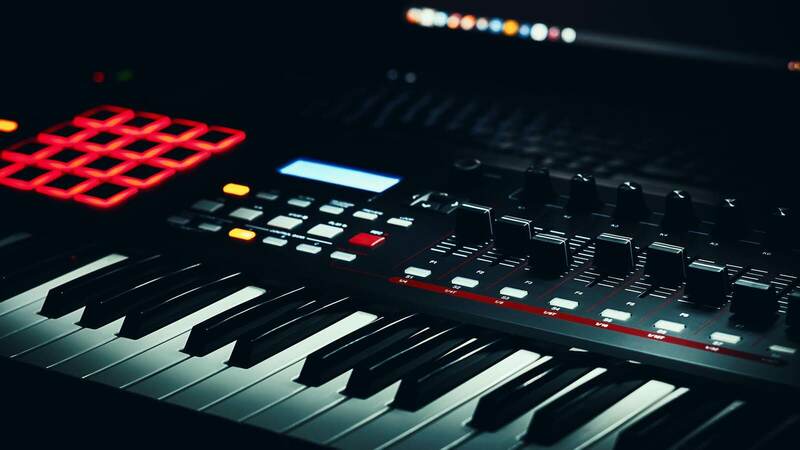 If you are a keyboardist then you will want to pick a MIDI keyboard controller and if you are a studio producer, you may desire a MIDI drum pad instead. If you are a musician who owns hardware synthesizers and you’re unsure if you want to invest in a MIDI controller because you’re not familiar, I suggest diving in. There is definitely a reason why so many musicians use them and they have become the industry standard. For the keyboards, I am going to break down 25, 49, 61, and 88 key MIDI keyboards. I will also talk about drum controllers and MIDI foot controllers as well. Pro Tip: If you aren’t looking to spend a lot of money, check out the best mini MIDI controllers. I break down affordable options that still get the job done really well. Why Do Bands Use MIDI Controllers Live? These keyboards are being used at every level for touring bands. For the past three years of touring, I would say I have seen them used at probably 85 percent of the shows we have played at. The reasons being simple, they’re portable, and they can give you basically any sound that you used on your record. For me, I have always wanted the ability to have the same sounds live as we do on our recordings. A MIDI keyboard controller was a good starting ground for me to see if this was the route I wanted to go. These are easy to program to your laptop by using a DAW such as Ableton Live or Logic. The good thing about these keyboards is they are generally not very expensive, which allows you to wet your feet a little bit before making a big investment. Before I get into my favorite controllers, Nektar has come out with a crazy good keyboard called the Panorama T4. I highly suggest checking out my review on it here. The key-bed is ridiculously good realistic. The Akai Professional MPK2 is everything you need in a MIDI keyboard. Akai is definitely mentioned frequently when talking about the best controllers available. Something I like about Akai products is that they are easy to map with your software. Some cheaper controllers work poorly when it comes to programming pads and triggers. Akai products come with their VIP software that has some world-class VST’s. This an award-winning software that instantly gives you sounds that you can use right out of the box. I really like the drum-pads on this keyboard as they are velocity-sensitive and they aren’t buggy at all. A big problem with cheap MIDI products is that the pad functionality isn’t great. Depending on what size you get, you will either get 8 drum-pads or 16. The 25 key instrument comes with 8 pads and any size up comes with 16 pads. So if pads are something you desire, you might want to purchase a keyboard with more than 25 keys. Having A MIDI keyboard controller that doesn’t have serious glitch problems is a very good thing. There’s nothing more frustrating than trying to map out MIDI and have it not register with your computer or device. The power supply for this is a USB cable, like most products. Something nice is that this MIDI keyboard comes with MIDI out and USB. The Akai Professional MPK2 series is the best series available right now. It’s affordable, it comes with ridiculous software, but it is also just very powerful and in depth. The Novation Launchkey MK2 has come so far for Novation in general. My first synth I ever purchased was a Novation about 8 years ago. MIDI technology has gotten so much better, and this product is just on another level than other Novation products. The Novation Launchkey MK2 is one of the best keyboards that you can use with Ableton Live as it is designed for that specific DAW. Right out of the box this will instantly work with your Ableton Live. I like that this comes with 16 pads even in the 25 key version. The drum-pads on the Mk2 are color-coded for Ableton Live as well which is awesome. This is a very low-cost, high-quality product. Overall, a solid product at a more than reasonable price. The price is what makes me like this controller so much. Novation has made a product that is extremely affordable, yet still very effective. The Akai Professional MPD226 is a great MIDI drum pad controller with 16 LED lit pads that have 4 different banks. It also comes with 4 faders, 4 switches, and 4 control knobs for maximum control over your device. It comes with the free version of Ableton Live which is a really solid DAW. The pads on the Akai Professional MPD226 are extra thick and velocity-sensitive. Having pads that are velocity is important because it gives you the power to play the pads more dynamically. There is MIDI in/out and also USB on this instrument. This instrument comes with 30 pre-set sounds, with configurations for most of the popular DAW’s. This MIDI drum pad comes with dedicated transport controls and I like how durable the pads feel on it. Often with MIDI instruments, you can come across cheap non-responsive drum-pads and this is just the opposite. This is a solid MIDI drum pad controller for a solid price. There are other products around the similar price range, but I would suggest this as I love the drum-pads on this controller. These are the best drum pads on the market currently and the only ones that are extra-thick. The Native Instruments Maschine MK3 drum controller is similar to the other Native Instruments MIDI controllers in the sense that it’s very powerful. There are a lot of features on this instrument and I personally think this is the most powerful drum controller available at the moment. The UI isn’t super straightforward and extremely easy to use, so be patient and watch videos on youtube to really figure out specific features and functions on this product. The drum pads were also made to be a little bit bigger than your typical MIDI drum products and I really like this. This MIDI controller comes with 8 GB of really cool high-quality samples. Samples are huge in music right now no matter what genre of music you’re in. The more samples you have and can dive into, the better. All of the knobs are touch-sensitive, which creates some cool dynamics when you’re messing with different sounds. The Maschine is quite expensive, but you will use this for the rest of your production career. I would recommend this product for musicians looking to create beats for EDM or for hip-hop as the sample library is pretty great. I like this instrument a lot, but it is very expensive. If you’re looking for a keyboard that is going to be with you for a long time without being upgraded, this is a good choice. The Native Instruments Komplete Kontrol 2 is a very powerful and expensive instrument. The key-bed is one of the things that gets many people as it has a fatar semi-weighted key-bed. This is a big deal since most MIDI keyboards don’t have very good key-beds. The 49 keys also have aftertouch and this is a big plus since most don’t have aftertouch. If you are looking at this instrument you will want to make sure you have a powerful PC or Macbook as it is very CPU intensive. The pitch-shifter is really nice on this product and it is one of the things musicians tend to really like. You can check out my guide to 49 key MIDI keyboards here. I break down the best options in full detail. I do like this product, but it is expensive and it’s not for everyone as there is a big learning curve, but when it’s working properly and the user knows what they’re doing, it’s very useful. The only downside is the price and it not working properly at times with pro-tools. M-Audio to me was not the name I thought of when I thought of controllers. However, I do like it a lot and the M-Audio Code is a step-up from any other MIDI product they have made. This keyboard comes with 49 velocity-sensitive keys with aftertouch and 16 different LED lit drum-pads. The M-Audio Code now features pro-tools, an extremely powerful and well used DAW. The software that is featured with this instrument is one of the reasons that I really like it. It does what most can do, but also comes loaded with so much software that would otherwise cost you hundreds of dollars. This is great for musicians who want to create and edit beats. The pad functionality is rather good and they feel nice on your fingers as well. This is a product that gives you a ton of free software that is high-quality. I would recommend this over many other MIDI keyboards in its price range because of that. The functionality is also really solid. The Alesis VI 61 comes with 61 semi-weighted keys and 16 drum-pads. There are a total of 48 different buttons that are assignable for triggering and mapping. You can use these buttons to control your VST’s and tweak them to your liking. Some people like being able to do this on their keyboard rather than on their computer. It comes with free software including Ableton Live Lite and AIR Xpand!2. You will find that the nicer 61 key instruments come with keys that have aftertouch and this is one of them. This is a huge plus to me as you can make some really cool things happen dynamically. The Alesis VI 61 has MIDI in/out and USB, so it is versatile when it comes to connecting to your computer or other synths. You don’t have to install any drivers for this to immediately work with your MAC or PC. One thing that is quite simple is the program mapping with this product. Many musicians have talked on forums about how easy it was to program the Alesis VI 61. Overall I think this is a good instrument for the price. The mapping on the Alesis VI61 is what stands out as well as having 48 buttons to program. You can have a lot of fun when you have this many controls at your command. The Nektar Panorama P6 61 is often forgotten about as a MIDI keyboard as a lot of people haven’t heard of the brand Nektar yet. This has been designed to be used with Cubase, Nuendo, Bitwig Studio, Logic Pro, Mainstage, Reaper, and Reason. The other DAW’s like Ableton Live have a lot of companies already targeting them. This can run with other DAW’s, it’s just a major plus if you use one of these DAW’s so you can take full advantage of the features. The Panorama has a channel strip control with a 100mm motorized touch-sensitive fader that is located by the mod wheels and it works with the volume of your selected track in your DAW. For pads, it has 12 velocity-sensitive pads that have a really good response to them. This is more expensive, so the hardware of this keyboard generally feels more expensive than a cheaper MIDI controller. The knobs don’t feel as cheap and the same with the mod wheels. The keys also have aftertouch which you will always hear me praising as I love this feature. I believe this is a very powerful instrument and it is one of the only products on the market with the motorized touch-sensitive faders. It is expensive and it also built for specific DAW’s, so that is our one fallback on it. The Arturia Keylab 88 is an 88 key keyboard with weighted keys. A lot of pianists desire the weighted keys as do I. The feeling of weighted keys can’t really be beaten, but it is not needed. I would recommend the Keylab 88 to a musician who is composing or playing live and has a lot of different sounds they want to incorporate. You can split the keys really easily and use multiple VST sounds per split and this is nice. The pads are also responsive and easy to program. I played on this while recording one of our albums and one thing I noticed is it doesn’t feel cheap. Many 88 key MIDI controllers are extremely cheap feeling because they don’t house any internal sounds typically. This feels heavy and really durable. I think this is built well, but it is a little dated. With that being said, the technology is still good on the MIDI. The Nektar IMPACT LX88 + is an 88 key MIDI keyboard that has semi-weighted keys and comes with some fun bells and whistles. It’s hard to find 88 key MIDI controllers that have faders and pads, but this one has just that. The instrument control feature allows you to take control of your DAW and control your instrument very easily. There are 6 transport buttons including rewind, stop, play, and fast forward. Nektar designed this to work with most of the major DAW’s so all of the faders and buttons should work immediately. You don’t have to install any drivers with this keyboard so you won’t be pulling your hair out trying to figure out how to get its software to work. You can program the buttons to work with a variety of different MIDI messages and one nice way to use these is to program them to change your synth sounds. I like taking advantage of this as I am constantly changing synthesizers on my keyboards. If you’re using 88 key controllers it’s probably because you want a lot of different sounds to be able to play at once. This has split mode and that comes in handy for being able to do that. Overall, this is a good option that isn’t terribly expensive. I personally believe there will be a better option coming out soon though for 88 key controllers. 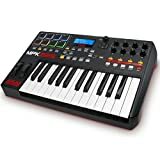 The Akai Professional LPK 25 Wireless is the first wireless keyboard and this is a MIDI controller that is perfect a college student or someone who needs something portable. If you like working on your phone or laptop on the go, this will be perfect for you. I really like this product since its wireless technology is surprisingly really nice. I am a huge fan of the Akai MIDI controllers because they work with any DAW right out of the box. The Bluetooth on this works great and you get a nice portable option here. I have been using the Behringer FCB1010 live for over a year now. I have nothing but good things to say about it. Durability and ease of use are the things that stick out with this product. You can read my full review of this foot controller here. Overall, this is my favorite foot controller. I use this currently in my band and the programming was a breeze. It is durable when it comes to gigging and the foot pads don’t break easily. What Are You Looking To Control? If you are looking to just control a computer, then all of the products listed will do this. Some of the controllers will offer more than others in the sense that they have more features. If you want to control a hardware synthesizer or a synthesizer module, you will need to get an instrument that comes with a 5-pin MIDI out port. The good thing about modern controllers is that they have come such a long way with compatibility with the major DAWS you run them with. In 2012 these were quite the nightmare to configure. Most of the products will work right out of the box with the software of your desire and some of them are made specifically for certain DAWS. A good amount of the keyboards come with software and VST synths for out of the box control. It is important to figure out what features you are looking for in an instrument. Most of these come with knobs, modulation wheels, pads, and faders. The pads, faders, and knob will help with creating beats. These are the buttons on your instrument that give you full access to your DAW’s playback and recording controls. These buttons make it so you can maximize your productivity while working. It is important to figure out your price limit so that when you look at the products you have an idea of what works with you for your desired price. For the most part, they are pretty portable. 49 key keyboards are heavily used for live music, but they are also being used heavily in the recording world too. We list the weight for each of the instruments so you can get a better idea of seeing how each controller varies in weight. Synth-action keys are the most popular when it comes to keyboard controllers. Synth-action keyboards are usually made with plastic keys and use springs instead of screws to return the key to its resting position. If you’re not a pianist, you will most likely prefer these over weighted keys because they’re easier to play. All of the keyboards below come with full-size keys, which are preferred typically over smaller keys. Most are USB powered and just plug into your laptop or tablet. If you don’t want to drain your battery as fast, you can use a powered USB hub or buy a controller that has its own power source. How Many Keys Do you Want? This is an important question and one that you should really think on. I believe it is easier to break it down by whether or not you are a pianist and what you’re trying to do? 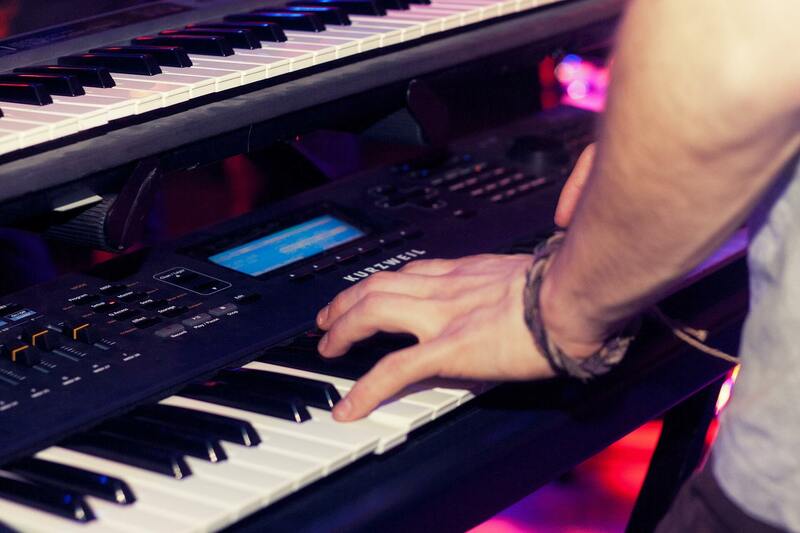 Are you a studio musician who is looking for enough keys to make noise and lay down ideas? If so, then a 25 key keyboard will get the job done easily. If you are a musician who is playing live and wants to split your keyboard with multiple sounds, go with something bigger like a 61 or 88 key. You could do 49, but for a small increase in price, you can get more keys. If you go with 88 keys, you can get one that has weighted keys and that’s a huge plus for a serious pianist. Click here to check out my favorite keyboards for making beats. MIDI stands for musical instrument digital interface. It was standardized in 1983 and it is maintained by the MIDI Manufacturers Association. MIDI sends messages that carry notes, vibrato, pitch, velocity, panning and clock signals. A MIDI keyboard can trigger sound modules from a specific amp. Something interesting about controllers is that you can send MIDI data through USB now instead of only MIDI cables. A good thing about instruments that use USB is they are usually bus-powered, which means you don’t need a power adapter for your instrument. One of the first big bands to start using MIDI technology was Rush. At this time, there was technology that is no longer made in the MIDI world. MIDI makes it possible for bands to do so much on stage now. Biggest Difference Between Expensive And Cheap MIDI Controllers? The biggest difference between an expensive controller and a cheap one is going to be software, quality/durability of the knobs and faders, key-bed durability, and quality of the exterior. This is a big reason why we like the Arturia Keylab as a budget keyboard, it’s cheap, but also extremely durable compared to the other budget keyboards. I definitely recommend spending the extra money to get the Akai MPK series for professional producers/musicians, but the Arturia Keylab is the keyboard that can kind of bridge the gap in a sense of quality, but not features. Do I Need A Sustain Pedal Input? This depends on whether or not you’re using this keyboard live or as a studio controller. If you’re using a 49 key keyboard live, we recommend using one with a sustain pedal, as you might want to sustain certain parts. Especially if you’re using a piano VST, you will definitely want the sustain pedal. MIDI data has gotten a lot better over the years as far as sustain to the point where it is reliable now. When you use your laptop live you will most likely want to buy a longer USB cable unless your keyboard is wireless. Make sure you keep the light sensitivity down on your laptop. This will make it so your laptop doesn’t overheat as easily. With all the lights on stage, it is easy for your laptop to overheat. Using a fan is also a really smart thing to do. This will keep your laptop cool while you use it for the best results possible. Always bring backup USB cables in case you break one during a show. No, you don’t need pads on your keyboard. Having the pads just gives the musician a little more freedom, however, you can still program drum sounds from your laptop without having to use the pads. One thing I will say is it is much easier to have drum pads if you’re just starting out. You have to be a pretty experienced music producer to feel comfortable programming intricate drum parts on the computer. Also, for live music, having drum pads can really help how much you are able to do as a performer. I have my pads on my keyboard switching all of my synthesizer sounds from my laptop, so I can have over 6 different sounds per song. I have found that if you take the time with keyboards, you can have a setup that allows you to play everything from the album and if you just don’t have enough hands, you can set the pads to trigger certain parts you’re not playing. You don’t absolutely need aftertouch, however, it is a feature that allows the keyboardist to really express themselves. What happens is MIDI data is sent to your laptop when you press down on certain notes harder than on others. A knock on controllers was that you couldn’t be as expressive on them as on a hardware synth, this is changing with aftertouch. Are MIDI Controllers Good For EDM Music? Yes, these are actually probably the most used keyboards for electronic music. The good thing about these controllers is that most of them come with trial versions of DAW’s and they also come with VST software so right out of the box you can access brand new sounds. 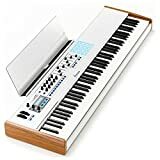 If you are brand new to music producing and you want to learn to be an EDM producer, getting a solid keyboard will definitely be one of the first things you do. This will be how you control your laptop and it will give you the ability to play parts and come up with countless creative ideas. I can’t imagine producing music at a high level without a keyboard. Have Most MIDI Controllers Abandoned The Traditional 5-Pin MIDI I/O? Yes, most MIDI controllers have started using the USB port since it is powered. Some don’t even have the 5-pin MIDI I/O anymore. The USB has been very reliable and now is now being used very frequently. What Kind Of USB Cable Do I Need For My Controller? The most common USB cable you will be using will be a USB A/B cable. A tip that is really important is that when I first started using controllers I purchased cheap USB cables. Don’t do this, they’re really not that expensive, so spend the extra couple dollars to get something that will be reliable and not cut out on you on-stage. It can be embarrassing if you lose power to your instrument. If yours also has a power supply, you can use the USB and still keep the power in just in case the cable gets unplugged. I recommend purchasing a longer USB cable as you never know how much ground you’re going to have cover on-stage. Stages can get pretty cramped and if you only have a 10-foot USB cable it will definitely haunt you at some point. Do I Need A Screen On My MIDI Controller? No, you don’t. However, I would say that having a keyboard without a screen is more so okay in a studio setting. If you’re trying to use a 49 key keyboard live and you don’t have an interface screen, it can get confusing trying to figure out if you’re on the right patch. The good thing is, most MIDI keyboards now have a screen so the musician can access more controls easier. Which VST’s/Plug-Ins Are A Must Have? This is a very common question in the controller world and it is extremely important. There are so many different VST’s that you can download and start using for your keyboard. VST stands for Virtual Studio Technology and these are the synthesizers that you will be downloading for your instrument. Most controller keyboards come with some VST’s, but we also want to give you some of our favorites. Nexus is one of the premiere EDM VST’s. This VST has been used on so many iconic EDM tracks and as you start using your controller with these sounds, you will start to recognize some of the patches. This VST is very easy to use with a keyboard compared to other VST’s as well. Sylenth is another really popular VST that is used all of electronic music. This VST has some really good bass sounds as well as some crazy sounding leads. Keyboards work very well this VST as it is definitely on the easier side to use. This is our favorite VST for sampled vocals and beautiful sounding string patches. The first time I used this VST with my controller I was blown away by the sounds. There is a small learning curve with this VST, but it still on the easier side. The one thing with this VST is you can’t do that much customization with the sounds compared to other VST’s. For vintage, analog lovers, this VST is really fun. Some of the synths in here sound so good. You’re going to get tons of pads with this VST. This VST is good for keyboard players looking to player synth-pop and synth-rock as it loaded with great sounds from the 80s. The Komplete VST includes Battery and Massive. Both of these extremely popular in hip-hop production today. Battery comes with really good hi-hat and 808 samples. This VST gives you a lot of control and is very different from other VST’s for your keyboard. It has a crazy wavetable where you can customize your sounds. This VST sounds like it is straight from the 80’s. This is a clone of the Oberheim, which is the same keyboard that “Jump” and “Tom Sawyer” were recorded with. Your keyboard will definitely provide you with some fun with this VST. This is a great all-around VST for your controller. This will give you a ton of sounds with a lot of control options. MIDI controllers are built to control sounds and access sounds. These are all solid options for your keyboard. What Is A MIDI Keyboard? MIDI keyboard controllers give you complete control over your DAW and VST’s. Some are built for specific DAW’s and have specific features for each DAW. These keyboards will still work with other DAW’s they just have extra features for certain DAW’s. We mention the MIDI controllers that are built for specific DAW’s above. I recommend using your keyboard with the DAW it is built for just because you will have extra features to play around with and get more in-depth with. I noticed that when musicians use their MIDI controller that’s built for a specific DAW with other DAW’s it can get a little buggy and have problems. DAW stands for digital audio workstation. DAW’s are used for recording, editing, and producing audio files. A DAW is going to be extremely important in the sense that most of the work you do with your keyboard will be on your DAW. This is the place you will be recording all of your songs and production ideas. Check out our favorite DAW’s. Here is an article I did on the best free DAW’s in 2019. Ableton Live is one of the most popular DAW’s for live music. Over the years it has become extremely reliable for live music with your keyboards. I’ve been using Ableton Live now for 5 years touring in a band and with every update, it just gets better and better. Ableton Live can also be used with a 49 key keyboard for making records in a studio, it is just more popular for live music right now. Finding a controller for Ableton Live can really help a beginner musician looking to learn a DAW since Ableton Live is one of the easier DAW’s to operate. Here is a video of one of our favorite DAW’s below. It also talks about the use of keyboard controllers with DAW’s. This daw can be used with your instrument for recording music. This DAW isn’t as popular as Ableton Live, but it’s getting more and more popular over time. A lot of people use this for mixing. You can use a controller to record into Cubase. Cubase is one of my favorite DAW’s due to the simplicity of it. Cubase is becoming very popular in the recording world and it is starting to challenge pro-tools. This daw is good for beginners and it is also built to work well with controllers. This DAW used to be entry-level, but over time it has gotten better and better. There aren’t any MIDI keyboards built for FL-Studio, but it is universal. Pro-Tools is a very common DAW and is used at the highest level of recording. I don’t know of any bands using Pro-tools live with keyboards, but this DAW is great for recording. VST stands for virtual studio technology and is also known as “software synthesizers.” Over the years these have gotten extremely compatible with VST’s to the point where there aren’t many problems. Some VST’s are modeled after famous hardware synthesizers. I really enjoy the Juno series with my keyboard controller because it sounds so close to the real synthesizer. Are All MIDI Controllers Wireless? Not yet, and it is surprising to us. I think that in the next couple of years we will start to see all of the new generations of controllers having wireless. Right now we are in a transition between USB cables transitioning all MIDI to wireless. As wireless becomes more and more reliable we will start to see it more for keyboards. Having stable drivers for your keyboard is a must and this is something that is often overlooked. When we mention MIDI controllers that used to have problems crashing when you would hook up to your laptop, this is why. Faulty drivers are no good and are not fun when you’re trying to use them for a live show where you need to be reliable. Any of the products in the high-end realm are not going to have this kind of problem typically. It’s the older keyboards and some of the budget controllers. This is just because they are built cheaper in every way. Instability has gotten much better over time and as MIDI technology in keyboards gets better, they will only become more and more stable. Musicians are heavily relying on their controllers full-time for studio-work and live music gigs. Having a product that is reliable and not crashing every five minutes will save a lot of headaches and even your wallet in the long run. The more controls you have on your instrument, the better off you will be, typically. I want a keyboard to do functions that I have to learn about to use. The more your keyboard can do, the more you will learn and the more groundbreaking things you can get into. What Is MIDI Polyphonic Expression? MIDI polyphonic expression is the method of using MIDI to enable pitch bend and certain other expressive controls to be adjusted for each individual note. This is confusing and relatively hard for many people to understand. When you use a MIDI keyboard and hit a note, you are sending three different values to the laptop or PC. The confusing thing here is that MIDI itself contains no sound, just numbers that are coding. To produce the sound you use a MIDI controller. The values that are sent are velocity, the note number, and the note-on. The controller controls a VST and this is what produces the sound we here. They aren’t going to have stock sounds, as they rely on using VST’s from a laptop or PC to generate the sounds. Bluetooth MIDI keyboards are new to the MIDI world. I am surprised by now that every controller isn’t Bluetooth, but I think we will get there soon enough. Having a controller that is Bluetooth would help in the sense that you wouldn’t have to worry about running a long USB or MIDI cable across the stage for live shows. As a touring musician, I have seen some of the cleanest and most unclean keyboards there are. Some musicians will go a couple days and then clean their instruments, whereas some will go 30-60 days without cleaning it. Even if you’re not a touring musician, when you let gunk built up in your instrument it’s not good. The faders can get a lot of dust that builds up that causes them to work improperly. Faders get beaten up pretty good on the road and it’s important to keep them clean so they don’t break on you. Having to deal with dirty keys is also not good. When you don’t clean your keys properly you are putting yourself at risk for becoming sick. If you’re playing shows every night and sweating on to your MIDI controller, the sweat can start to turn your keys yellow. If you can keep the dust off your keyboard, I strongly recommend doing this. The more often you can clean your MIDI controller, the better you will be in the long run. I like to use isopropyl rubbing alcohol to clean my keys because it dries very quickly and kills germs. I lightly dab a paper towel with the alcohol and then gently press on the keys and clean them. Another good way to clean your keyboard is by using compressed air and spraying the knobs and faders to get the dust out. Dust is not good for any instruments really, especially electronics and keyboards that have holes for the dust to reach the internals. If you’re not cleaning your instrument on the road, they can also begin to smell from the sweat. This is just not a good sign in general, as the sweat can harm your keyboards over time. A MIDI keyboard would come in handy while composing modern classical or jazz music. Playing these styles of music on a keyboard controller would also make a lot of sense. If you are a jazz lover, you can access some of the best organ and electric piano sounds that you can think of. These make it so the musician can quickly change their instrument sound while playing live. For a verse, you can play piano and for the chorus, you can quickly switch over to an organ or pad. Can I Use A MIDI Controller For Church Band? Yes, you can. I recommend doing this if you are a keyboard player. If you show up to church band with a controller you know how to work, your musician friends will love playing with you. I feel like a keyboard controller just gives you so much more than a keyboard would for around the same price range. Keyboards also don’t have the sounds like a controller has access to. If you’re playing in church, make sure you download some Hammond B-3 patches. The good thing about using a controller is you can find so many VST’s with different sounds on them. You can also set your instrument to change patches directly on the keyboard. This is helpful for when performing live with your church band. The arpeggiator function is actually pretty simple. What you will want to do is click the arpeggiator button on and then from there, it will vary depending on what kind of keyboard you have. For some controller arpeggiators, you will have a control panel where you can change the pattern and change the number of notes. Is It Possible To Be A Music Producer Without A Controller? Yes, it is possible. However, you will most like want some sort of keyboard to plug into your laptop so you’re not just programming all of the notes. You can program the notes using a mouse, but this will take a very long time to come up with parts. Even if the music producer is trying to save money, not having some sort of keyboard can hinder them when producing. You can use these for so many different things while producing that it would only be a setback to not be using one. Over the years MIDI keyboards have come a long way. When this technology was first being used there were a lot of kinks to be worked out as far as with the laptops and computers. Newer controllers work so much better now than they did 10 years ago. Part of this is because technology has gotten better with computers as well as MIDI. Do I Need A Case? It depends, are your touring? If you are touring, then you will definitely need some sort of case for your MIDI controller. If you are strictly using your keyboard for recording in a studio, then you don’t really need one. If you are going on the road or gigging frequently we recommend a hard case. You don’t need a hard case, however, any serious musicians who are gigging frequently don’t want to be putting their keyboard in a trailer in a soft case. A MIDI keyboard controller comes with many more features than a hardware synthesizer. Hardware synthesizers will always have a place in the music world, but controllers are starting to take over the synthesizer world. The reason why these are becoming so popular is because of the rise of the music producer industry. With it becoming more and more easy for producers and bands to make music out of their bedrooms with their laptops, controllers have shined. This is because a gives the musician access to literally any sound the can possibly want by using VST’s. MIDI keyboards can access VST’s that emulate all of the best hardware synthesizers. I used to be a musician who would rather play hardware synthesizers, but after years of making music and touring, I’m really starting to like where the controller world is heading. The best hardware synthesizers do offer unlimited creative control. But, the learning curve on hardware synthesizers can also be a little grueling. This is not saying to not purchase a hardware synthesizer, because they are absolutely great, it’s just MIDI controllers are also great. MIDI Controller Vs. Keyboard Workstation for Beats? This is a tough question. Keyboard workstations were the cream of the crop years ago. They still are extremely powerful instruments. This is going to come down to the preference of the musician. If you’re a musician who doesn’t have a laptop or computer that can run a DAW without crashing, a workstation can be a good route. The difference between a MIDI controller and a keyboard workstation is that controllers don’t have internal memory or sounds. Keyboard workstations are the most powerful stations there are, however they are extremely expensive. MIDI controllers become just as powerful and probably even more powerful because they use a laptop for recording and accessing sounds, whereas the keyboard workstation is basically a gigantic computer. The biggest difference is that keyboard workstations synthesizer sounds aren’t going to have as good of a sound as keyboard controllers can access. With this being said, I own a keyboard workstation and numerous controllers and I still find uses for both of them. You can check out our favorite keyboards for making beats here. 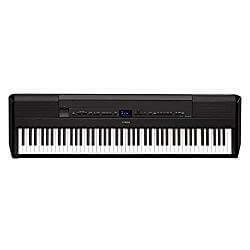 If I Currently Own A Digital Piano But Want To Start Producing Music, Should I Buy A MIDI controller? Yes, you should. I had an upright piano and a could digital pianos in the beginning and as soon as I purchased a controller, a whole new world opened up. Digital pianos work well if you’re songwriting and just looking for melodies and chords, but if you are wanting to let sounds create some songs, a controller is the way to go. MIDI keyboards are built for producers who want to experiment with sounds and effects. Digital pianos don’t really do this. You can use a digital piano as a controller if it has USB or MIDI, however, a controller will give you features like pitch-bend and mod-wheels. Check out the link above to read more on these instruments. You’re talking about a piece of equipment that is literally designed to just control sounds for producers vs an instrument that isn’t really known for having crazy cool sounds. You can program your drum pads on your MIDI controller to change the synths on your MIDI keyboard. This is something that is super useful for live music. I use a MIDI controller drum pads to change all of my synthesizers while playing live. You can download a program called TouchOSC and use a laptop that you connect to your laptop or PC. I use Ableton live for all of my synthesizers and I use TouchOSC to switch songs. When I switch songs on my Ipad, it changes on the laptop to whatever synths I have set for each song. If you have 16 pads on your MIDI controller, you could potentially have 16 different sounds on one song. You will need a router to do this. You will connect your laptop and Ipad to the router so they’re on the same network. This is a very advanced technique, but it is very reliable. Is A MIDI Controller A Good Purchase For A Kid? If you’re looking to get your kid into music and they don’t want to start by learning the piano, a controller can be a wise investment. One thing I will say is you might want to wait until the kid is old enough to use a laptop and has a basic understanding of using programs because they can be a lot to handle at first. However, as they get older and more into music, there really is a lot they can do with a keyboard. I hope you found this information to be extremely helpful. If you have anything to add or have any questions, hit me with them below in the comment section! Hello there! My name is Chris and this is a blog where I love to review all things keyboards and music industry related. On my website, you will find in-depth reviews on the latest MIDI controllers, digital pianos, keytars, and insight into the music industry. I have been playing the piano for over 20 years and I have been experimenting with MIDI controllers for about 5 years now. I have been hooked on learning more about keyboards because I find them incredibly interesting. About 5 years ago I started touring with my band so I like to share as much insight as I can when I do all of my reviews. Because I have been able to tour, I thought it would be a fun idea to share all of my knowledge I have gained over the years in hopes of helping others. We are a participant in the Amazon Services LLC Associates Program, an affiliate advertising program designed to provide a means for us to earn fees by linking to Amazon.com and affiliates sites.